High power 'Hybrid' Ultra-Low Noise (ULN) lasers were developed by Morton Photonics (MP) through the hybrid integration of a high-performance gain chip and novel fiber external cavity including a custom fiber Bragg grating (FBG). These devices provide high power (100mW), with the required ultra-low linewidth/phase noise and relative intensity noise (RIN) for use in a broad range of optical sensing systems, ﻿to improve the spurious free dynamic range (SFDR) in RF Photonics links, and to improve performance in coherent communications systems. The ultra-narrow linewidth of these devices is particularly important in systems utilizing optical mixing to generate a microwave signal, or down-convert an optical signal to baseband, in order to provide a high fidelity (low amplitude and phase noise) RF output signal. 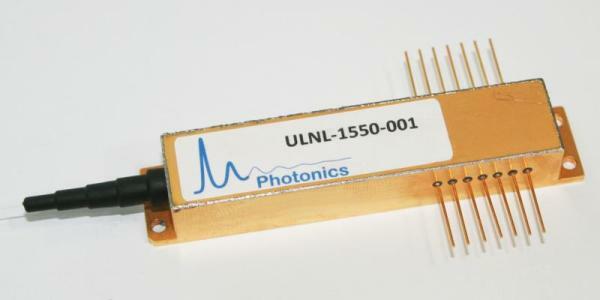 MP ULN lasers have been successfully utilized to directly develop an optical frequency comb in a silica micro-resonator with a single-soliton state, without the previous requirement to use an erbium doped fiber amplifier (EDFA) and a modulator, greatly simplifying the soliton generation setup and making it more practical for a wider range of applications. This research is part of the DARPA DODOS program let by Bowers/UCSB, of which MP is a team member. ​​MP has developed ideas to translate the Bragg grating based ULN laser designs onto the Silicon Photonics platform, for integration with additional silicon photonics components, in collaboration with the Bowers group at UCSB. These Extended-DBR (E-DBR) devices, as well as novel full C-Band tunable integrated ULN lasers (using a microresonator based reflector), are being developed using heterogeneous integration of III-V on silicon for the laser gain section, plus ultra-low loss (ULL) waveguides in silicon nitride or silicon for the Bragg gratings and microresonators, which provide the optical cavity and feedback in these devices.﻿ Initial results have been measured from these fully monolithic devices, although so far they are unpublished. 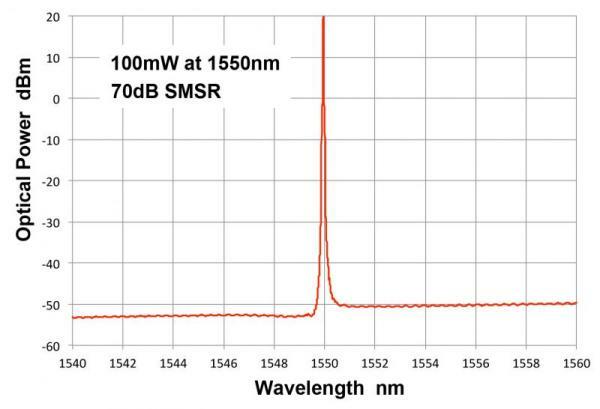 MPs prototype Hybrid ULN laser devices exhibit extremely stable singlemode operation, through novel external cavity and custom FBG designs, providing a side-mode-suppression-ratio (SMSR) typically over 70dB, as seen in the measured optical spectrum below, additionally providing extremely low RIN, typically below -165 dB/Hz, and ultra-narrow Lorentzian linewidth operation, below 100 Hz for the 'standard' ULN laser device, and as low as 15 Hz for extended cavity length devices. The clear improvement in performance for high SFDR analog links based on the ultra-low RIN of initial prototype lasers was presented at the IEEE AVFOP Conference, 2012. The excellent performance and operational characteristics of these hybrid integrated lasers are described in the 2018 Journal of Lightwave Technology paper, 'High-Power, Ultra-Low Noise Hybrid Lasers for Microwave Photonics and Optical Sensing’, (Early Access).